217 Beacon is located on the south side of Beacon, between Clarendon and Dartmouth, with 215 Beacon to the east and 219 Beacon to the west. 217 Beacon was built ca. 1866 for merchant, cotton manufacturer, and real estate developer Charles William Freeland, for speculative sale, one of five contiguous houses (211-213-215-217-219 Beacon) designed as a symmetrical composition, with 211-213 Beacon and 217-219 Beacon having shared porticos and full bays, and 215 Beacon, in the center, having no bay. Originally numbered 199-207 Beacon, they were renumbered 211-219 Beacon by 1868. Click here for an index to the deeds for 217 Beacon. On May 6, 1870, 217 Beacon was purchased from Charles Freeland by wool merchant William Hilton, He and his wife, Esther Althine (Ward) Hilton, made it their home. They previously had lived at 89 Pinckney. They continued to live at 217 Beacon during the 1882-1883 winter season, but moved thereafter to 17 Commonwealth. 217 Beacon was not listed in the 1884 Blue Book. On November 27, 1883, 217 Beacon was purchased from William Hilton by Agnes Maria (Claflin) Davis, the wife of Charles Davis, Jr. They previously had lived at 118 Charles. Charles Davis was treasurer of the Atlantic Dyewood Company. Agnes Davis died in March of 1885. 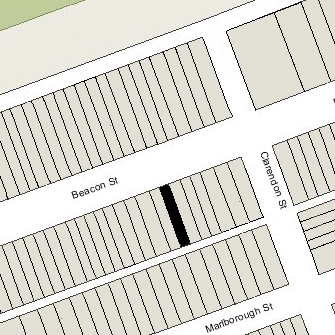 Charles Davis continued to live at 217 Beacon in 1888, but had moved to 28 Blagdon by 1889. Agnes Davis’s estate continued to own 217 Beacon and lease it to others. By the 1888-1889 winter season, it was the home of William Croad Lovering, a cotton manufacturer in Taunton. He was a widower. He previously had lived at 46 Newbury. William Lovering was elected to Congress in 1896. 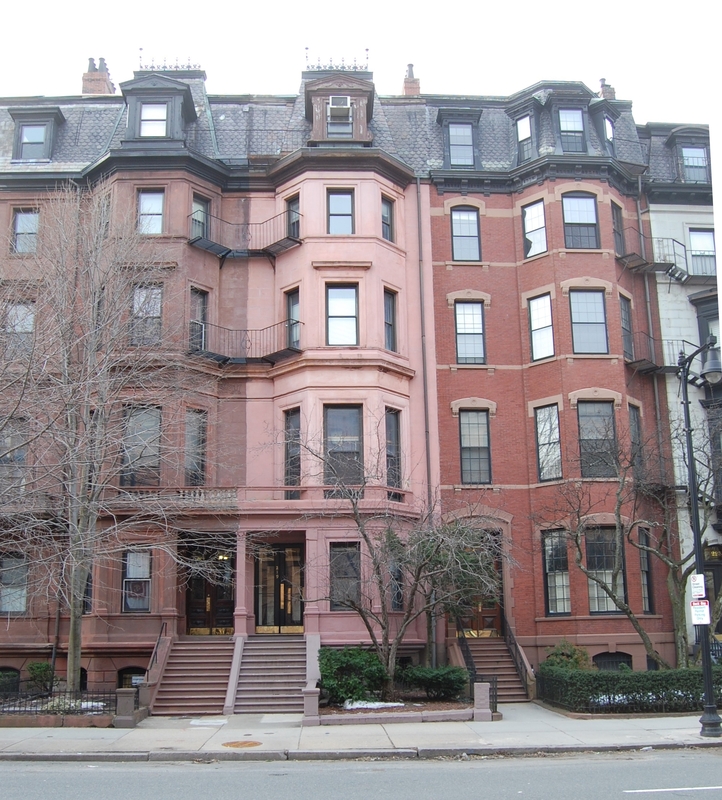 He continued to maintain his Boston residence at 217 Beacon during the 1886-1897 winter season, after which he moved to 357 Beacon. By the 1897-1898 winter season, 217 Beacon was the home of dry goods merchant Wolcott Howe Johnson and his wife, Fanny J. (Betts) Johnson. They had lived at 302 Berkeley in 1897. 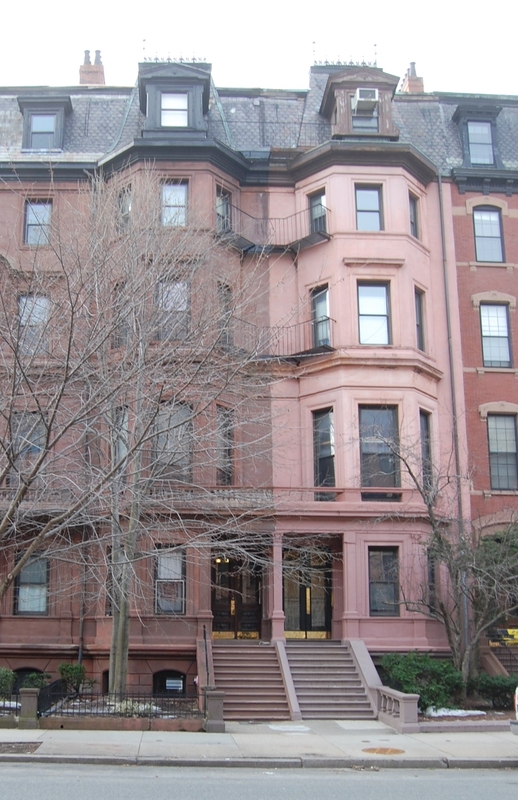 They continued to live at 217 Beacon in 1899, but had moved to 7 Commonwealth by 1900. During the 1899-1900 winter season, 217 Beacon was the home of dry goods merchant Francis Wright Fabyan and his wife, Edith (Westcott) Fabyan. The previous season, they had lived at 232 Beacon, and by 1901 they had moved to 222 Beacon. 217 Beacon was not listed in the 1901 and 1902 Blue Books. In 1902, 217 Beacon was the home of Col. Henry Sturgis Russell and his wife, Mary Hathaway (Forbes) Russell. They previously had lived at 281 Beacon. They also maintained a residence, Home Farm, in Milton. Col. Russell was Boston Fire Commissioner; he formerly had been a shipping merchant in the East India and China trade in his father-in-law’s firm, John Murray Forbes & Co., and had served as president of the Continental Telephone Company. By 1903, they had moved to an apartment at 191 Commonwealth, where he died in February of 1905. During the 1902-1903 winter season, 217 Beacon was the home of Charles Albert Read, Jr., and his wife, Ellen Arvilla (Hatfield) Read. They had lived at 431 Marlborough during the 1901-1902 season. Living with them at 217 Beacon was Ellen Read’s niece, Adelena Hatfield. Their principal residence was in Manchester. 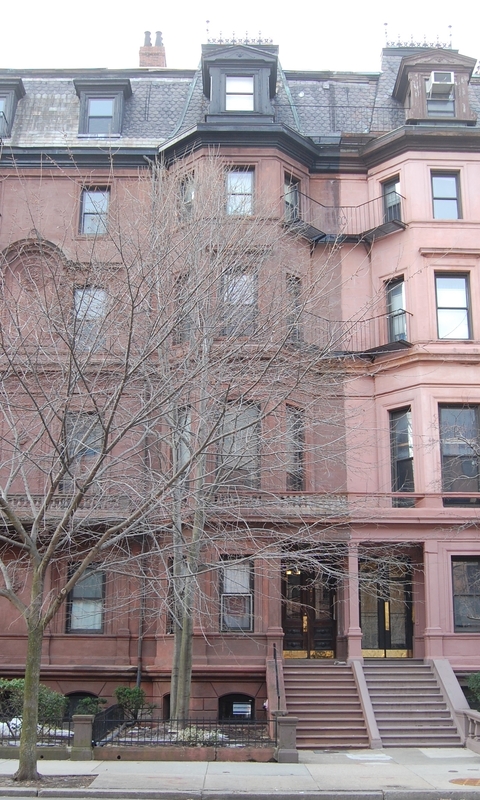 By the 1903-1904 winter season, 217 Beacon was the home of Olivia A. (Dodd) Bigelow, the widow of jeweler and bank president Abraham Orlando Bigelow, and their daughter, Helen Olivia Bigelow. They previously had lived in Jamaica Plan, and before that at 325 Beacon. 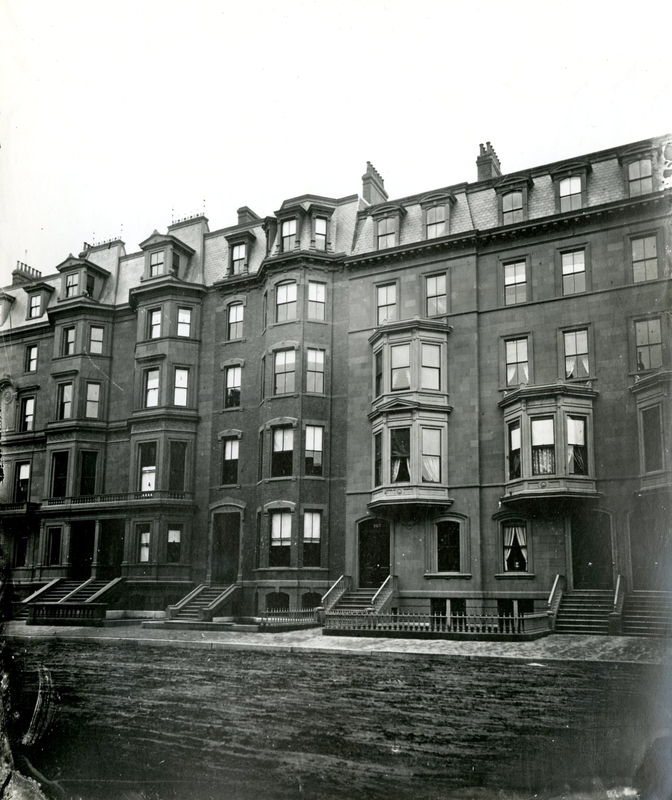 They continued to live at 217 Beacon until Olivia Bigelow’s death in December of 1905. In 1907, 217 Beacon was the home of attorney Charles Benjamin Barnes, Jr., and his wife, Josephine Lea (Low) Barnes. They previously had lived at 3 Exeter. They also maintained a home in Hingham. By 1908, they had moved to 15 Marlborough. By the 1907-1908 winter season, 217 Beacon was the home of Dr. Lincoln Davis, a physician and surgeon, and his wife Katharine Bradlee (Crowninshield) Davis. They previously had lived at 315 Marlborough. They continued to live at 217 Beacon during the 1921-1922 season, after which they moved to 279 Beacon. By the 1922-1923 winter season, 217 Beacon was the home of Ellery Sedgwick James and his wife, Louise Russell (Hoadley) James. They also maintained a home in East Hampton, New York. Ellery James was the Boston resident partner for the private banking firm of Brown Brothers & Company. They continued to live at 217 Beacon in 1926, but moved soon thereafter to New York City. By the 1926-1927 winter season, 217 Beacon was the home of former US diplomat Francis Munroe Endicott and his sister, Mrs. Florence Elizabeth (Endicott) Davis Haven. She was the widow of Chester Hasbrouck Davis, a wholesale boot dealer, and of Franklin Haven, Jr., a banker. Francis Endicott and Florence Haven previously had lived at 35 Beacon; they also maintained a residence in Beverly Farms. Florence Haven died in November of 1933. Francis Endicott continued to live there until his death in July of 1935. On September 16, 1937, 217 Beacon was acquired from Aaron Davis and Charles Claflin Davis, the children of Charles and Agnes (Claflin) Davis, by Dorothy A. Palmer of Waterville, Maine. Later that month, she also acquired 219 Beacon. On August 30, 1939, 217 Beacon and 219 Beacon were acquired from Dorothy Palmer by Adelard Monet, a former dealer in furniture and household goods He lived at 377 Beacon, where he operated a lodging house. By 1940, 217 Beacon became the home of Patrick Kearney, a fireman, and his wife, Mary Rose E. Kearney, who operated it as a lodging house. They previously had lived in Medford. They continued to live at 217 Beacon in 1943, but had moved to 352 Marlborough by 1944. By 1943, 217 Beacon was the home of John Dever, a painter and decorator, who operated it as a lodging house. In April of 1944, John Dever purchased 185 Beacon from Adelard Monet’s son, Roger F. Monet, and subsequently moved there. Also in April of 1944, Adelard Monet filed for (and subsequently received) approval to change the occupancy of 217 Beacon from a single-family dwelling to a lodging house, legalizing the existing use. On June 6, 1947, 217 Beacon was purchased from Adelard Monet by Charles Green, a retired millwright at the Baker Chocolate factory, and his wife, Jennie (Russell) Green, who continued to operated it as a lodging house. They previously had lived at 40 Chelmsford. On October 25, 1954, 217 Beacon was acquired from the Greens by John W. Erlemann, a former waiter, and his wife, Karoline (Riess) DeFelice Erlemann, who continued to operate it as a lodging house. They previously had lived at 239 Beacon, which they continued to own and operate as a lodging house until the mid-1950s. On June 25, 1963, John Erlemann transferred his interest in 217 Beacon to Karoline Erlemann. They separated at about that time and by 1966 he was living at 15 Gloucester. Karoline Erlemann continued to live (and operate a lodging house) at 217 Beacon until about 1972. On October 11, 1972, 217 Beacon was acquired from Karoline Erlemann by real estate broker and investor Patrick J. Glynn, who continued to operate it as a lodging house. In September of 1974, he acquired 213 Beacon, in May of 1975, he acquired 211 Beacon, and in January of 1978, he acquired 215 Beacon. On January 22, 1991, Patrick Glynn transferred 217 Beacon to himself and his wife, Anne T. (Kelly) Glynn, as trustees of the 217 Beacon Street Trust. In November of 1994, Patrick Glynn applied for permission to convert the property into 17 apartments. His application was denied and his appeal was dismissed by the Board of Appeal. The property remained a lodging house in 2016.